Hair transplantation is a surgical technique which involves removal of hair follicles from one part of the body known as donor site to the bald or balding part of the body known as the recipient site. The technique is used for treating male pattern and female pattern baldness. It is also used to restore eyebrows and beard hair. The whole procedure is done under local anaesthesia. It is a single day procedure and does not require any admission.With a typical hair transplantation procedure, we can expect about 800 to 1,000 follicular units to be transplanted. For larger sessions with larger areas of hair loss, we may transplant 3,000 to 6,000 follicular units. Hair transplant results are permanent. It is also combined with Platelet rich plasma (PRP).The growth factors released activate the proliferative phase and produce new follicular units. This results in improvement in hair density and stimulation of growth. In 2-3 months new hair starts coming out and in 5-9 months patients start to see a considerable amount of hair emerging from the scalp. 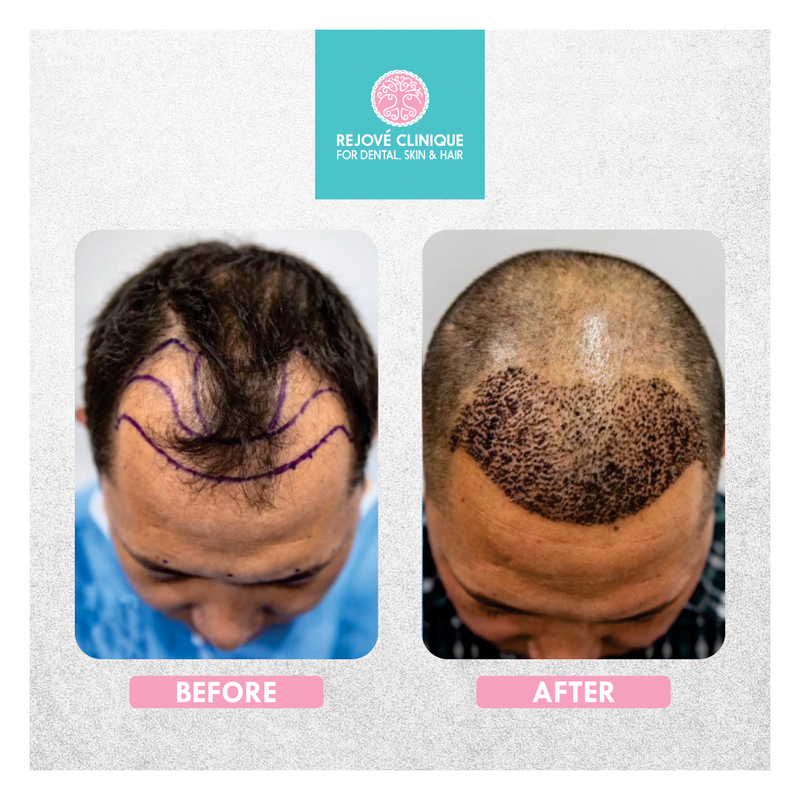 This treatment is done at Rejové Clinique to get rid of bald area of the head. It is performed after giving local anesthesia to the person undergoing treatment. A person undertakes this treatment when he faces hair loss. The causes for hair fall can be intake of drugs, depression, imbalance of hormones or deficiency of nutrients. Trichologists are the specialists those help the patients to overcome the problems like hair fall, hair breakage, hair thinning, miniaturization of hair diseases of the scalp. A person who is undergoing the treatment of hair transplant at Rejove Clinique is a permanent solution and is at par with normal hair. The condition of your hair is an indicator of your general health. Hair which is dull and lifeless can suggest a stressed, unhealthy lifestyle whereas hair which is full and shiny is a sign of good health. a) Follicular Unit Transplantation The surgeon removes a 6- to 10-inch strip of skin from the back of your head. He sets it aside and sews the scalp closed. This area is immediately hidden by the hair around it. The surgeon’s team divides the strip of removed scalp into 500 to 2,000 tiny grafts, each with an individual hair(s). The number and type of graft you get depends on your hair type, quality, color, and the size of the area where you’re getting the transplant. b) Follicular Unit Extraction Hair follicies are removed in this process by using specialized cutting equipment. The balding area is then provided with the follicies. The scalp is punctured to receive the grafts using micro surgical needle followed by inserting an angle at grafts. There are a range of common skin flaws that can make us conscious about our looks. These include uneven skin tone, dullness, acne, scars, fine lines and wrinkles. PRP or Platelet-rich plasma is a simple, cost-effective and feasible treatment option for acne scars, hair loss, androgenetic alopecia and wounds. At Rejové, you will find friendly medical health professionals, who will guide you towards a better dental health and perfect oral hygiene.